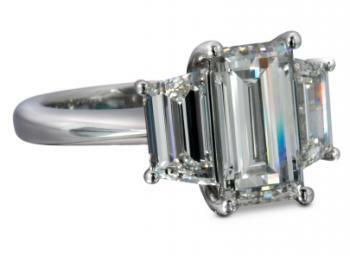 An engagement ring is a tremendous investment, often costing hundreds or thousands of dollars. The idea of a discount ring may seem contradictory, but in fact there are many ways to purchase a high-quality ring at a sizeable savings. Watching store sales, shopping jewelry outlets and utilizing trade-in services are great options for discount ring shopping. Jewelry stores and department stores with fine jewelry departments often have bridal sales, allowing customers to purchase certain styles of rings below regular list prices. Sometimes stores will offer deep discounts on a selection of discontinued or clearance merchandise that may be reduced by fifty percent or more. These items can be great finds and often represent changing styles or overstocked merchandise. The selection is limited but changes frequently. With perseverance, you can find good deals on engagement rings. Sears: If you haven't looked for jewelry in Sears lately, you'll likely be pleasantly surprised by the extensive selection of fine jewelry available here, including wedding rings. Lovely styles are offered every day below suggested retail, and additional discounts are often offered through special sales. Watch Sunday newspaper circulars and online advertisements from Sears to find out about special sale pricing on diamond rings. Zales: With store locations throughout the U.S., as well as an ecommerce store, Zales is one of the most widely recognized names in retail jewelry. The store carries an extensive selection of bridal jewelry and often offers special sale pricing. Visit the website clearance section to find the most deeply discounted selections. Enter your email address to receive sale notifications and special offers. Kay: This widely known jewelry store also has an impressive retail store presence and online shopping options. The store frequently offers special sales, advertised in-store, online, via television commercials and through other methods. Kay's website has a section devoted to clearance items, so it is a great place to browse for deeply discounted rings. You can also register your email address to receive special offers and notification of sales. Dedicated outlet stores are great repositories of discount merchandise, including wedding and engagement rings. The styles are often identical to those found in mainstream stores, but with significantly reduced prices. Many outlet stores carry discontinued and overstocked items as well as former display models and slightly damaged items. Be certain to examine an engagement ring thoroughly for loose stones, scratches, and other weaknesses. Such minor defects can be repaired quickly and inexpensively, making outlet store purchases a great bargain. Zales Outlet: In addition to traditional retail stores and online shopping, Zales also operates over 135 outlet stores throughout the U.S. and Puerto Rico. Located primarily in premium outlet malls, these stores carry discontinued, close-out and clearance merchandise transferred in from the company's regular lines. New items arrive each week. Houston Diamond Outlet: Offering wholesale pricing directly to the public, Houston Diamond Outlet is an excellent resource for finding deeply discounted prices on high-end engagement rings. You can shop online or make an appointment to visit the Houston, Texas showroom to view selections in person. Ross-Simons Outlet (online only): While Ross-Simons does not have a brick and mortar outlet store, the company does offer an outlet "store" option on its website. Pieces available via the online outlet are offered at deeply discounted prices, with many selections priced between 50 and 70 percent below regular retail. Most people think of trade-ins as something associated with cars, not jewelry. Many jewelers and pawn shops, however, are happy to accept quality pieces of jewelry to be traded toward new pieces or to be reset into new settings and designs. The credit you receive for jewelry that you trade in can greatly offset the cost of purchasing a ready-made or custom-made engagement ring. Even if you don't have jewelry to trade in, visiting jewelers and pawn shops that accept trades can help you find a great deal on your own ring. That's because items received on trade are often offered for sale as previously owned pieces for a fraction of what similar selections would cost new. Note that trade policies are store-specific. For the best results, contact jewelry stores and pawn shops in your community to find out what is available to you locally. Long's Jewelers: This jewelry store with five locations throughout Massachusetts accepts diamond trade-ins, as well as other types of jewelry and watches. Shane Co.: With locations in 14 major U.S. cities, Shane Co. is a good choice for those seeking to trade-in jewelry to apply toward the purchase of an engagement ring. The company accepts trades based on fair market value, provided the new jewelry purchase meets or exceeds the value of items being traded. H & H Jewels: This Miami-based jewelry store accepts trades of previously owned jewelry items to be applied to the purchase of new pieces. Pawns stores are also a great jewelry trade-in option. To find a pawn store in your area, visit the U.S. Pawn Shop Directory. You'll need to enter your state, then select your city from the online database. You'll receive a results page with the name, address, and contact number for listed locations in the area chosen. 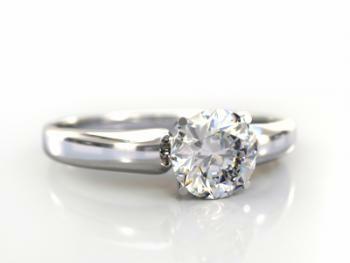 Finding a sale, trading in old jewelry or purchasing jewelry that someone else has traded in are not the only options for finding discount engagement rings. There are a number of factors that impact ring price. 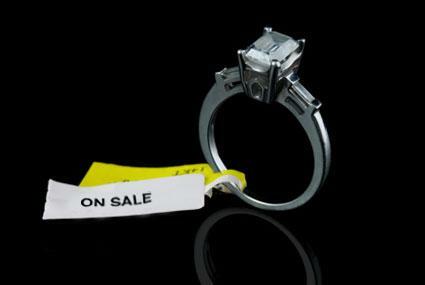 Learning what to look for when searching for a discount ring can help you identify the best possible deals. Diamond quality: Before shopping for a diamond engagement ring, be sure you understand the four Cs: cut, clarity, color, and carat. Judging diamond quality can be tricky because each of these factors greatly influences the price, but selecting a less-than perfect stone does not mean it is inferior. Most diamonds are graded on elaborate scales, and dropping a grade or two can reduce the price without being immediately visible to the casual observer. 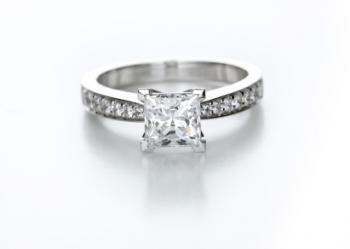 Stone type: An engagement ring doesn't automatically need to be a diamond ring. If the woman prefers colored stones such as rubies, emeralds, or sapphires, they can create a gorgeous engagement ring with a significantly lower price tag. 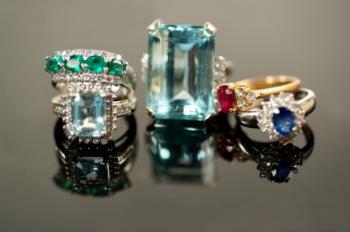 Diamonds can still be incorporated as accent or side stones, while the larger stone is a less expensive gem. Pearls and birthstones also make elegant engagement rings and are often paired with smaller, less expensive diamonds. Ring type: When shopping for an inexpensive engagement ring, you can often find lower prices simply by purchasing something other than what the store labels as an engagement ring. Many jewelers offer diamond and other gemstone rings labeled as anniversary, birthday, promise and special occasion gifts for less than traditional engagement rings. No matter what the jewelry is labeled, always be sure to thoroughly inspect the ring to be certain you are purchasing a quality piece. Metal selection: Another way to cut corners on cheap engagement rings is to consider the type of metal for the ring. Platinum engagement rings are the most expensive, but you won't sacrifice quality or style if you stick to silver or white or yellow gold. Lower karat values are also less expensive so consider a 12- or 14-karat ring instead of an eighteen karat ring. Generally, two-tone rings and those with extensive filigree patterns or etching on the metal are also more expensive, so avoid these styles when shopping for a bargain. From retail sales and clearances to outlet stores and pawn shops, engagement rings are readily available for anyone interested in a bargain. It is possible to buy a quality engagement ring without going broke. Purchasing a discount engagement ring does not cheapen the love or relationships they represent. In fact, such a decision can highlight the financial responsibility of the couple and their fiscal sense as they plan their life together.